At 5:15, I couldn’t get comfortable in bed, so I went out to the living room to sleep on the couch. After spending some time getting adjusted with pillows and a too-short blanket, I fell asleep and found when I woke up that it was 6:30! I looked outside. 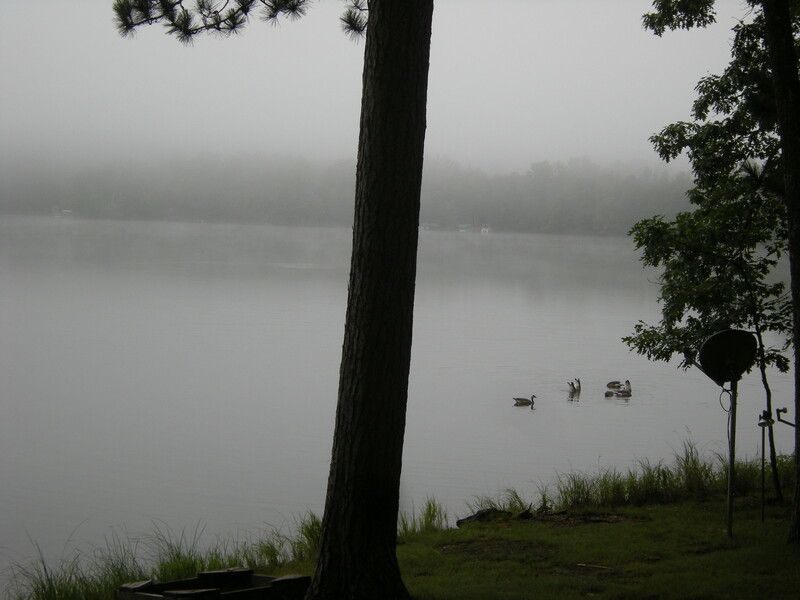 The lake was calm and wisps of fog were drifting over the far side of the lake. I took a picture, to be labeled “6:30 a.m. on Lake U.K.”, as a part of my series of the lake at different times of day and weather. 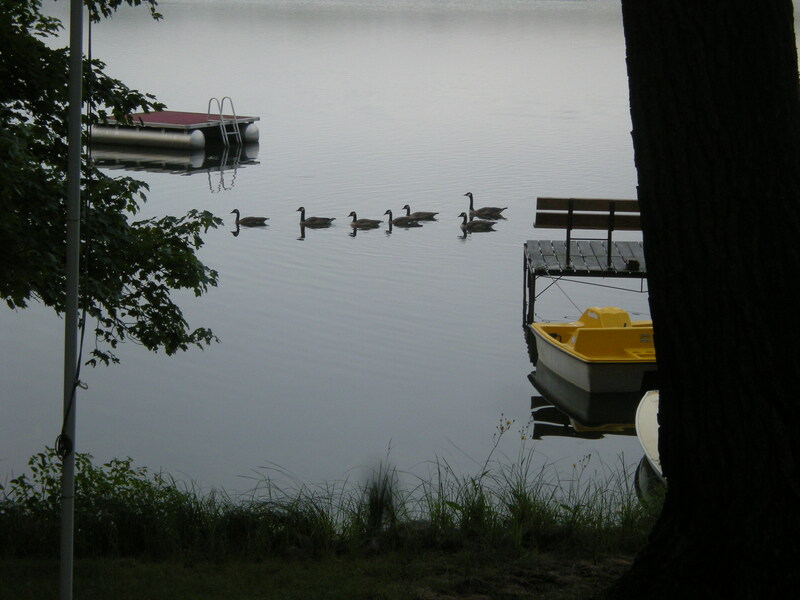 A group of Canada geese was gliding over the surface of the lake, headed in the direction of our pier. 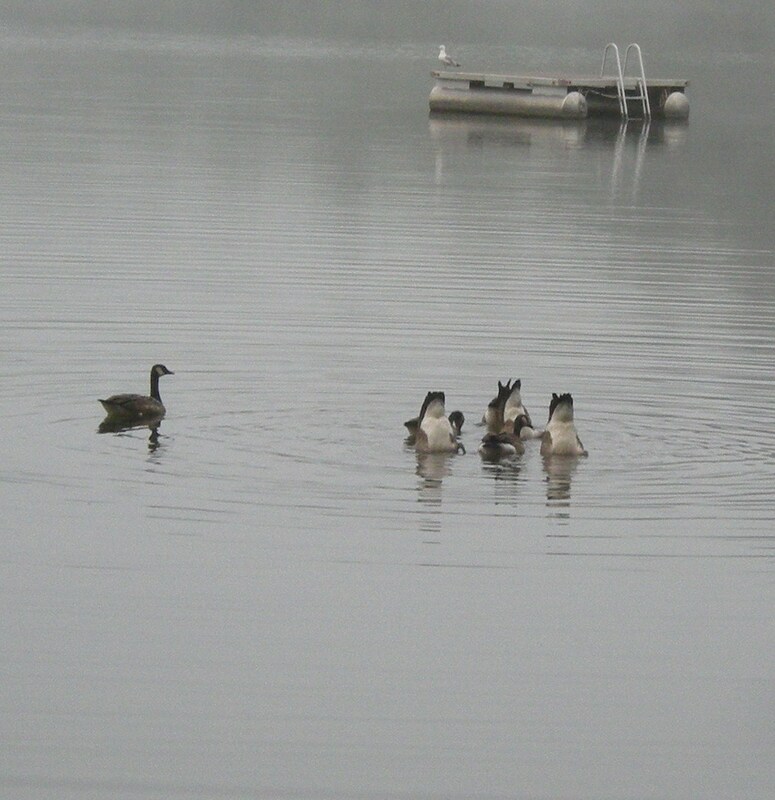 Dale and Judy had said they’d seen Canada geese on the lake, but I never had, until this moment. 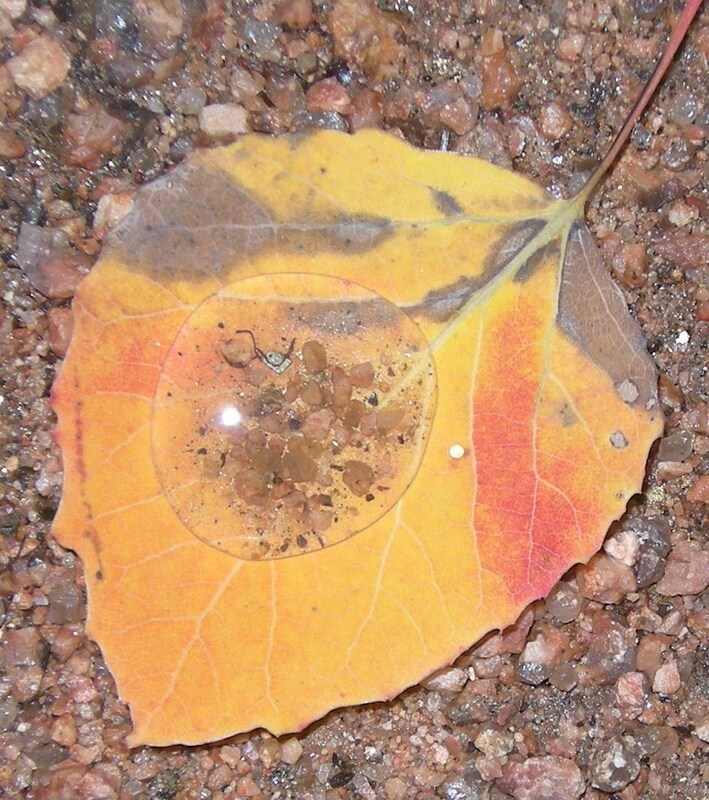 I slipped outside and took a picture. They passed under our dock and reappeared on the other side, then sat on the lake just beyond the trees to the left of our property. One of the geese started honking insistently: “nnng-gah! Nnng-gah!” It wasn’t the usual honk of a geese that I remembered hearing or would have taught preschoolers as the sound a goose makes. It starts with a sort of low growl and ends with an emphatic GAH! – an accented, higher pitch sound. I tried to imitate it myself. I couldn’t get the GAH pitch quite right. I moved to where they were not partially obscured by trees to find out why the goose was doing that. All seemed to be turned in the same direction, looking at something. It was a lone duck, crossing their path in the water, closer to shore. The duck stopped and stayed very still. Was she feeling intimidated? One lone duck against seven much larger geese. Geese can be mean if one gets in their way. But they all just sat there looking at each other or at nothing in particular. After a stand-off of a few minutes, the duck continued on her way, silently sliding across the glassy surface of the water. It’s amazing how graceful these water birds are. Their webbed feet must be paddling under the water very fast or very efficiently, but their motion does not disturb the surface of the water. The geese followed, now in silence. There was nothing particularly menacing about their behavior. Perhaps they’d reached an agreement with the duck, communicating through the body language of water birds. It almost looked as though they formed one group, with the duck leading the way, but I noticed the duck’s path turned slightly away. On the other side of our pier, the duck was way out front, no longer part of the group. She floated on and was soon lost to my view, while the geese congregated in a group a little distance from the pier. I continued watching them as one after another tipped over to fish something in the water to eat. It looked funny with its body and feet sticking up out of the water, its head and long neck under the surface. Soon all the geese were fishing in turn. I got my camera ready and crept silently down closer to the water and aimed with my telephoto lens. Sometimes most all of them were fishing at the same time, which looked very funny. I took several pictures until I captured this! The layer of fog on the far shore covered the tops of all the trees. I took more pictures. 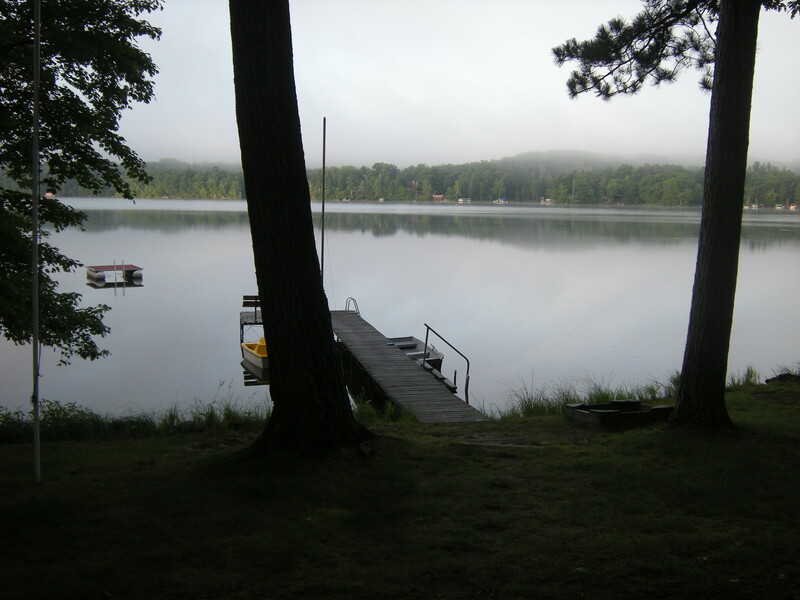 I went back to reading my book and Dale went out on the dock to throw in a fishing line. A few minutes later, I heard flapping over the water. It was a whole group of ducks, skidding along the surface with their feet and lower bodies, while they flapped their wings. Suddenly and in tandem, they all stopped and simultaneously reversed direction. I think this skimming over the water is their way of having fun, and I admired their ability to all reverse and stop at the same time. 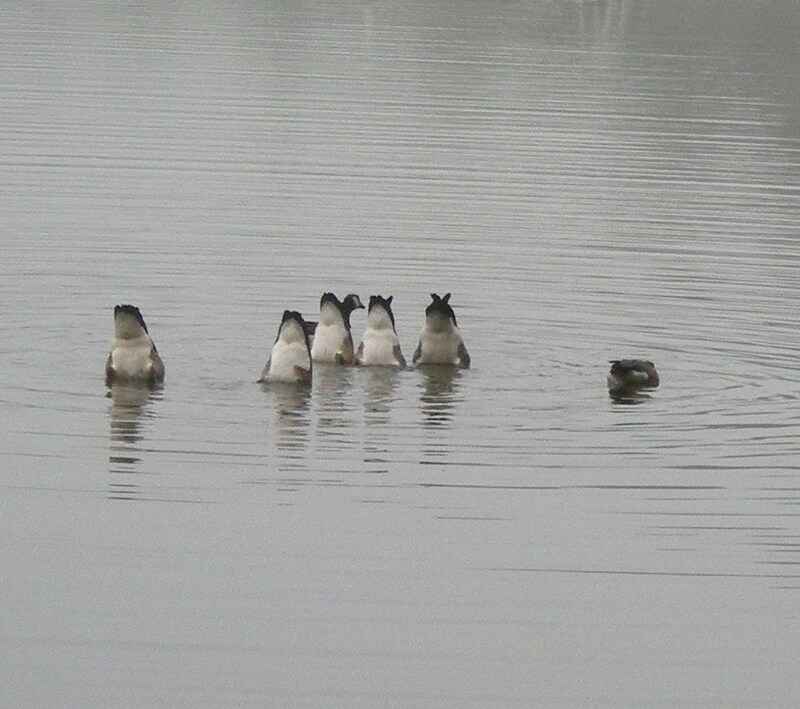 I wondered if the lone duck I’d seen earlier had joined this group. The ducks started fishing. When a duck fishes, it doesn’t tip its body all the way up to grab something deeper in the water like the geese. The duck simply puts its head into the water, while its body remains in the same position on the water, like a buoy. I realized that ducks and geese probably eat different things – while the duck lowers its head to capture what is close to the surface – small minnows probably, maybe some bugs or floating plants – the geese, with their long necks are able to reach down toward the bottom of the lake (which is really shallow right now anyway), maybe crayfish or somewhat larger fish. With this revelation, I read a couple of more pages. I am disappointed that I have not seen or heard loons. The only time I heard a loon was the night of the storm. I heard its forlorn call as the wind blew stronger and the storm approached. I heard it again during the rain. Its call was hard to hear amid the heavy rain, wind and thunder. (I did not take the above photo – I copied it from 2passthetorch.com, because I don’t have any loon pictures). Dale says he heard two loons the previous day, calling each other from opposite ends of the lake. My sister told me she only saw and heard one when they were here the week before last. 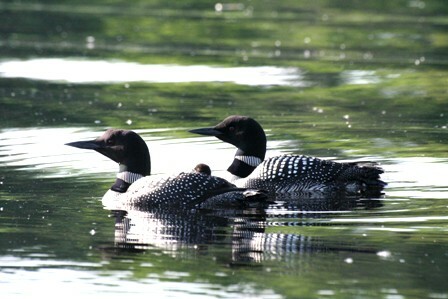 At the beginning of the summer, part of the lake was closed off to motorboats because there was a nesting pair of loons! So I was encouraged by Dale claiming to have heard two loons. Perhaps all three are around, somewhere. Still, it is surprising that I haven’t seen one or heard it except for that night. Perhaps the loons have moved away and only come to our lake to visit. I hope the baby survived!